The aesthetic of Budapest is an endearing and contrasting mix of old & new, sophisticated & shabby, and often wonderfully eccentric. The ruin pubs of Budapest, housed in abandoned buildings and decorated with unique flair and mismatched furnishings, are an integral element to many people’s perception of the city; but these are relatively new phenomena, springing up in the last sixteen years or so following the pioneering Szimpla Kert ruin bar. If you were to look at a Budapest ruin pub map, it would be quiet the crowded chart, such as the sheer amount of ruin bars dotting the districts of the city. 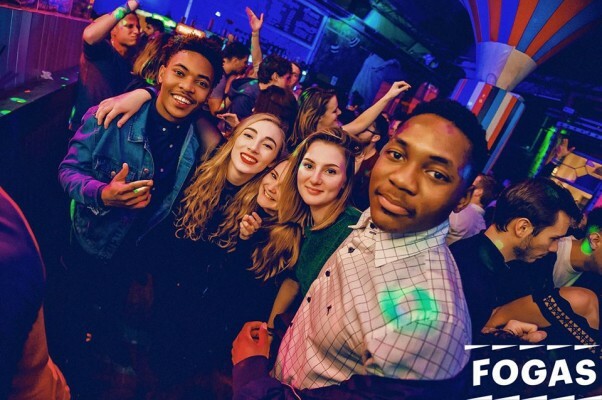 They have contributed to a now world-renowned vibrant nightlife that has left the dingy, post-socialist image of Budapest behind, and become integral to a proper night out. You could join a ruin pub crawl or tour to experience some of the popular ruin bars in Budapest, but if you’re trying to figure out which is the best ruin pub for you, and which ones to avoid, look no further as we’ve put together this helpful list of the best ruin pubs to visit in Budapest in 2018. Szimpla was the first ruin bar on the map of Budapest, established in 2001, and although in a different location now, it is still one of the best ruin pubs in the city and enjoys cult status as the original ruin pub pioneer. That fame has meant Szimpla, as well as being a local’s hangout, has become a popular mecca for snap-happy tourists which, depending on your sensibilities, might take a little bit of the ‘authenticity’ out of the experience – but still an absolutely worthy ruin pub to visit for atmosphere. Find it at VII., Kazinczy u. 14. 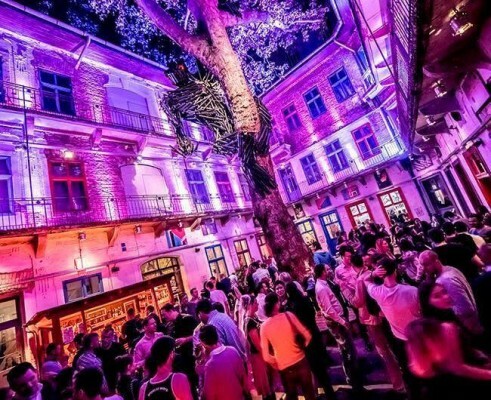 Fogasház is a popular local ruin bar & club and is one of our stops on our pub crawl in Budapest. 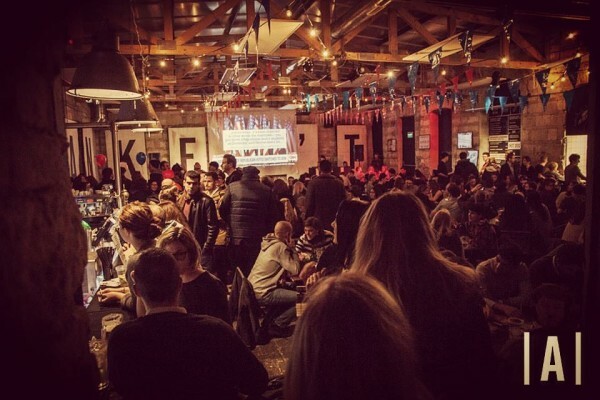 There is always a party here, and so is a safe bet if you desire dancing into the early hours! Find it at Budapest VII. Akácfa utca 49-51. Find it at 1072. Budapest, Klauzál street 10. Red ruin makes the list thanks to it’s a light-hearted approach to poking fun at Budapest’s quiet turbulent and tumultuous history as the city’s only communist-themed pub! Full of good vibes and atmosphere, the décor is predominantly red and quirky, with ‘punderful’ plays on joining “the party” adorning the walls. 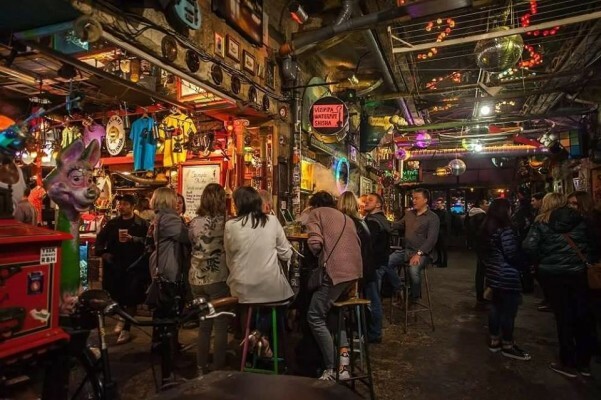 At heart, it’s a rock bar, with very friendly staff and great service and is certainly worth a visit when in Budapest, especially if you’ve gotten up to speed on the relatively recent communist history on a free tour. Find it at Irányi utca 25 1056 Budapest. Fügeudvar deserves to be on this list for a few reasons, but most notably because it is the cheapest ruin bar in Budapest. It’s a great place to start your night, though being open until 4 am, it is absolutely a good place to stay all night too! It’s pretty big, with lots of side rooms to explore – a common ruin pub trait. Find it at Klauzál u. 19, 1072. Ankert is one of the last remaining ruin bars that still champions the ideals inherent to the original authentic ruin bar culture – a place for art, exhibitions, festivals, movies, and community, as well as great atmosphere and the friendly diverse crowd, made up of disciples of various local subcultures. 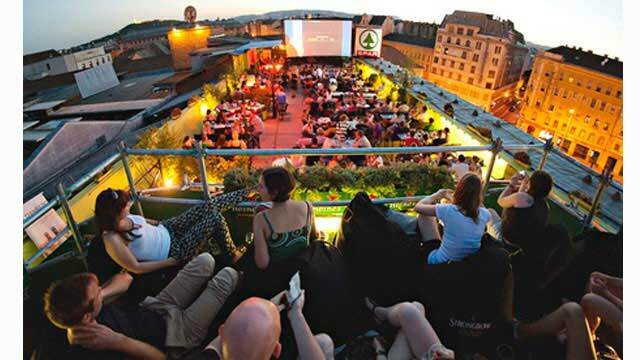 The largest open-air ruin pub in Budapest, Ankert offers delicious food (including Vegan pizza) and tasty cocktails in a wonderful environment and is well worth checking out. It’s one of our pub crawl ruin bars too, so you can visit with a ready-made crew of party-buddies! Find it at Budapest, Paulay Ede u. 33, 1061. And last but by no means least, Corvintető deserves a mention for its elements of wackiness – with a bar in an old elevator, a huge roof terrace overlooking the amazing cityscape and lights of Budapest from dusk ‘til dawn, and the retro 80’s-inspired, red-lit indoor section where techno and dancehall provides the soundtrack, Corvintető really is a very interesting ruin bar to frequent while in Budapest. That’s it, ruin bar explorers, 7 of the best ruin pubs to visit in Budapest in 2018. 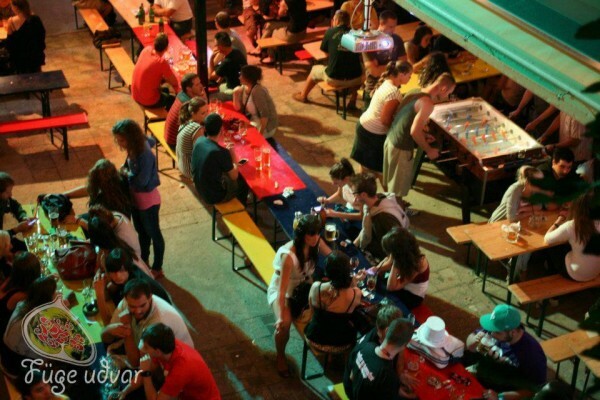 Each one offers something different and unique, so make your own Budapest ruin pub map and venture out on your own ruin pub crawl, or join us on the Backpacker Pubcrawl for a great night out and visit some of these and more, including Ellátóház and Kuplung, both excellent ruin bars too! Let us know which you think is the best ruin pub in Budapest in the comments. Na zdraví!